There is one smoke alarm on every level of the home and inside and outside each sleeping area. Smoke alarms are tested and cleaned monthly. 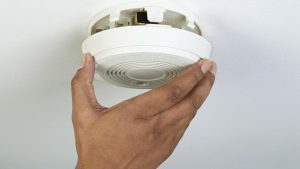 Smoke alarm batteries changed at least twice a year. Smoke alarms are less than 10 years old. Cooking area is free from items that can catch fire. Kitchen stove hood is clean and vented to the outside. Pots are not left unattended on the stove. Electrical cords do not run under rugs. Electrical cords are not frayed or cracked. Circuit-protected, multi-prong adapters are used for additional outlets. Large and small appliances are plugged directly into wall outlets. Clothes dryer lint filter and venting system are clean. Candles are in sturdy fire-proof containers that won’t be tipped over. All candles are extinguished before going to bed or leaving the room. Children and pets are never left unattended with candles. Family members who smoke only buy fire-safe cigarettes and smoke outside. Matches and lighters are secured out of children’s sight. Ashtrays are large, deep and kept away from items that can catch fire. Ashtrays are emptied into a container that will not burn. Have two ways out of each room. Know to crawl low to the floor when escaping to avoid toxic smoke. Know that once you’re out, stay out. Know where to meet after the escape. Meeting place should be near the front of your home, so firefighters know you are out. Practice your fire escape plan.